I must be on a lemonade kick or something . . . yesterday’s Raspberry Lemonade cupcakes and now this . . . I saw the ingredients to this recipe and thought that it sounded different, but yummy. Who knew that lemonade concentrate would make slow cooked chicken taste so good? 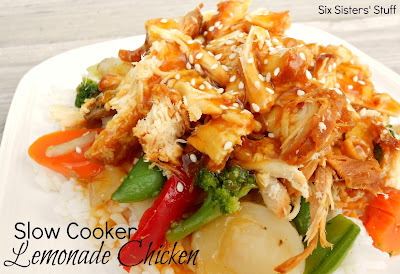 If you like sweet and sour sauce, I really think that you will love this chicken. It’s kind of a fun spin on the lemon chicken you would find at a Chinese restaurant. I shredded our chicken as soon as it was finished and served it over rice and stir-fry vegetables . . . it was an easy and delicious meal! Spray slow cooker with non-stick cooking spray. Place chicken breasts in the bottom of your slow cooker. Combine lemonade, brown sugar, ketchup, and vinegar in a bowl. Mix well and pour over chicken breasts. Cover and cook on low for 6-8 hours or high 3-4 hours. Mix cornstarch and cold water together. Simmer the remainder of the sauce over medium heat on your stove top and add cornstarch mixture to the sauce, stirring until incorporated. Let sauce cook over medium heat for a couple minutes (about 5) or until the sauce has thickened. Pour sauce over chicken, sprinkle with sesame seeds, and serve. Recipe adapted from Crock Pot Chicken. Coupon Lynx carries the largest selection of printable grocery coupons, codes, freebies, restaurant coupons, and daily deals from Coupons.com, RedPlum, SmartSource, CouponNetwork, SavingStar, Cellfire and so many more. Save 50-100% on your groceries using the tips they provide. Never pay full retail price again! Stop by and visit them today! Oh man!! Sounds so good! I will try this for sure!! This looks so good. But I'm curious if it wasn't super sweet using a whole can of concentrate. Thanks for sharing another great recipe. Did you put the frozen ch. breast in the cooker or thaw first? I'm wondering the same thing, did you thaw the frozen breast, or cook it from frozen? BRAVO once again on another awesome recipe!!! I just love your site! Whenever I post I get the word out there I you guys, especially on your recipes, their just so easy! Feel free to link to crockpotking.com, I always have something going on too. KEEP IT COMIN GIRLS!!! Bravo once again! Do they have to be chicken breasts or can another part of the chicken be used? We hardly ever buy chicken breasts, usually thighs. Thanks! Amber, I think that thighs would work GREAT! They would be delicious! I made this tonight and it was super tart/sweet. We ate it but it was hard for my little ones to get down. SO what do you think I could use the leftovers for?? Maybe another recipe or freeze and use in something else? Made this tonight and everyone LOVED it ( I have 5 kids ages 1-12)!!! The baby had 2 helpings! I see that others have commented that this was too tart. Maybe they added a whole 12 oz lemonade concentrate? Our stores around here only sell the lemonade concentrate in the 12oz sizes, so I had to make sure I halved it before adding. Just a guess. It had just the perfect amount of "tang" to it that a sweet and sour dish usually has. Thanks so much for this great recipe!!! i accidentally added the whole 12oz, what can i do? this was just ok for me. my kids ate it but complained about it. the lemonade flavor really shines through, and i did only put half a 12 oz can in. I made this last night and the kids were not impressed. I doubled the recipe using a 12oz can and froze half in a bag with chicken to crock cook later. I think if I try it again I will tweak it some. Overall the sauce was good. It gives me some ideas! Pretty tasty! Reminiscent of my favorite lemon chicken takeout I used to get. Used half a 12 oz. frozen concentrate. Three year old ate it up, too! I wouldn't compare it to sweet and sour, but lemon chicken for sure. Yes can someone answer the question about putting the chicken breasts in frozen please. We put the chicken breasts in the slow cooker slightly thawed.